Congratulations to President-Elect Barack Obama! Barack Obama warned us that some would try to make this big election be about small things. My warning is that we donâ€™t let this big opportunity only lead to small change. More than 137 million voters cast ballots this election, up 14% from 2004. 63.7 million (56%) of those people voted for Barack Obama, giving him more votes than any candidate in the history of US Presidential Election history. That is what you call amandate. Being the candidate with more supporters than any other President has ever had, Obama has been given a chance to serve more people than anyone could imagine. He can impact the finances of millions of people. He can improve the health of hundreds of millions of people. He can increase the moral standing of a nation in the eyes of billions of people. What a great opportunity to carry out public service and set the tone for the spirit of shared service & shared sacrifice that he so eloquently espouses. The level of support and passion surrounding Barack Obama says more about the people supporting him than about Obama himself. It says that Obama is an inspirational figure, but that was evident before he started running for President. More importantly, it says that people are hungry. Hungry for change. Hungry for a new approach. Hungry for something to do. This is why Obama always talks about this election not being about him, but instead being about us. With everybody so hungry, the onus is on the Obama team to give us something to eat. I donâ€™t want a snack. I want a full, seven course meal. Legions of people do not organize for incremental change. Armies form to march forth into bold victory. Now is our chance to make real, fundamental change in very progressive ways. This change will not happen because Barack Obama is a progressive. It can & will happen if we push our government, our newly-elected President, and, mostÂ importantly,ourselvesÂ to work towardsÂ the new kind of politics that Barack Obama helped us to believe was possible. Letâ€™s be bold. Letâ€™s ask for a lot out of this administration. Letâ€™s make Barack Obama a successful President by ensuring that he keeps his promise to start making big changes to the way America works. We helped him make history on November 4th.Letâ€™s keep making history for the next 4 years. P.S. Homework assignment: Everyone under 30 should talk to someone over 60 about what this election means to them. YES! Magazine released today their 12 Ways You Can Safeguard the Vote tool. It contains links to lots of great resources, and tips for what you can do before, on, and after Election Day to make sure that your vote is properly counted. Check Your Registration. Make sure there are no errors, mistakes, or discrepancies which would prevent you from being able to vote. Vote Now. Vote early, in person or by mail, if you can in your state. Check if you can using Know How To Vote. Learn how to vote. Read your voter pamphlet to understand how your paper ballot works, and if voting using an electronic machine, get a clear demonstration first. Identify State & Local election officials. Get their names and numbers because these are the people to call if there are problems. Vote as early as possible on Election Day to avoid long lines & hassle. If you have ID, bring it with you. If you have a cell phone, bring that too. Avoid straight-party voting. Vote for each race individually, to make sure your votes each count exactly as you want them to. Verify your vote, especially when voting on an electronic voting machine.There have already been cases in states like West Virginia where people used the touch screen to select Barack Obama but had the machine count their vote for John McCain.Â Just like at the store, get a receipt. Observe, Document, Report. If you or anyone else that you see has issues voting, take good notes & inform the authorities using resources such as 866-OUR-VOTE. They save the most important pieces of advice for last. These are the steps we can take to make all future elections exercises in democracy, not insanity. Call your candidate. Encourage them to challenge results you donâ€™t trust. Sign up to help. 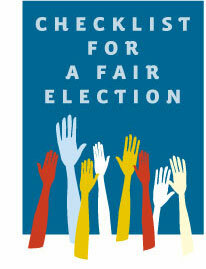 Work towards fair and transparent elections. Learn about election & voting issues, and take action before the next election. P.S. I recently joined the Communications Advisory Board of YES! Magazine. On Monday, I was interviewed as part of a small series on Politics and Technology by Jeffrey Powers of Geekazine.Â We talked at length about early voting,Â why itâ€™s such a big issue this election, what are the types of good & bad things that we can do with early voting data, and ways that people can find out early voting information with tools likeKnow How To Vote. Iâ€™m looking forward to talking with Jeff again about Politics and Technology soon. Yesterday afternoon, I participated in a call with new NAACP President & CEO Ben Jealousheld a press conference with Black bloggers and members of the Black press to kick off his tenure and discuss his top 2 priorities: helping Hurricane Ike survivors andensuring full participation in the upcoming election. Some poor communities complained to the NAACP that they were not adequately warned of the storm, its seriousness, or the voluntary/mandatory evacuations. This is because the warnings happened almost exclusively on TV, and these people had no TV. People with questions in the state and out of state can call the NAACP Command Center, which is at their Texas State Conference, at (512) 322-9547. It is a travesty that the NAACPâ€™s Command Center is set up before FEMAâ€™s. #2 is very important, and itâ€™s this â€œsocial voter registrationâ€ capability that really sets this tool apart from other online voter registration tools. ManyÂ people know they have friends that are not registered to vote. If you know that personâ€™s email address, you can give them a very simple way to register quickly online. Additionally, the system will send people reminders by email and/or text message to let them know when to vote and where to vote, if they want it too. Pretty cool. This was a good meeting for Jealous, and he demonstrated a new way of thinking about the NAACP and about advocacy & civic engagement. By including Black bloggers in his first press conference, Ben Jealous showed that blogging and other forms of new and online media will be an important part of the NAACPâ€™s strategy going forward. By creating its first real online tool, the NAACP shows that technology and the Internet will be important parts of their strategy going forward. I am looking forward to see what they do with this momentum. Iâ€™m just as excited as the next activist to see so many people engaging in the electoral process this year. People are phone-banking, canvasing, knocking on doors, calling their congress members, etc. All of this volunteerism is beautiful, an expression what passionate political participation by an informed and interested citizenry should look like in a democracy. Well, there is actually one big thing not to like: Very, very little of this is sustainable.Thatâ€™s right. 95% of this enthusiasm and participation will likely die the day after election day, with the other 5% dying the day after inauguration day. Why is this not sustainable? This piece is part of Day of Blogging for Community Organizing Justice: â€œI Am a Community Organizerâ€. Republicans donâ€™t like Community Organizers. Rudy Giuliani and Sarah PalinÂ ridiculed them specifically in their speeches last Wednesday at the Republican National Convention in St. Paul, MN.Â This modern crop of Republicans has demonstrated how much they hate grassroots organizing in many ways with their hatred or unionization, their damnation of dissenters inside and outside of the government, and their willingness to ignore the rights, thoughts, and actions of the people of foreign nations that they decide to invadedestroy occupy â€œhelpâ€. For every generation leading up to [and including] the current one, the only foray for Black people to better their lives collectively has been through community organizing. When I say community organizing, I donâ€™t just mean the highly visible ones like Malcolm & Martin, I mean the invisible ones that most of us will never hear or speak of that sacrifice their time, treasure, and talents so that peopleâ€™s day-to-day lives are better and that their voices are heard. This is the path that nearly all Black politicians have taken to attain the capital needed to even run for office, let alone win. For one to minimize the work of organizers is to minimize the thoughts, actions, and efforts of all minorities and underrepresented groups who wish to uplift themselves individually and as a whole. As you may remember, I have been writing for a couple of months now at a site calledSocial Media for Social Change. The creator of that site, Michelle Riggen-Ransom, is moderating a panel at the upcoming 2009 SXSW Interactive conference called Social Media for Social Change, and, if accepted, I will be a panelist. Exploring ways non-profits and businesses are using social media to drive social change. From forums sharing life-changing information to online communities loaning money to entrepreneurs in Africa: social media tools and applications are powerful and growing. Find out what folks just like you are doing to change the world. Iâ€™ll be talking about the online activism work that myself and others have been doing, specifically how The SuperSpade and other members of blacknetaction are impacting the offline world through our online efforts. This is an important topic, as technology is moving beyond the realm of mere entertainment and utility. Realizing that we can use the social media tools we love and create to not only make money but to make life better in a truly holistic sense is the key to the growth and sustainability of our industry. What I Need You to Do: VOTE!!! Please vote before voting closes on August 29th. Vote early and vote often! If youâ€™re feeling extra generous, sign up and leave a comment with your thoughts on the topic. Then, take a look at some of the other extremely interesting panels. The sick thing about the use of tasers is that it is often portrayed as a less severe form of punishment because proponents say, â€œWell, at least I am not using a gun.â€ This belies the fact that you can die from being tasered such as how â€œ17-year-old Darryl Wayne Turner died: He had cardiac arrest after a Charlotte-Mecklenburg police officer shot him with a Taser gun. And I know that it is very strategic for blogs to insert pictures or use videos to help illustrate their points. However, the downside of this strategy is that things are not â€œrealâ€ unless someone can supply visual evidence. So when I think about tasers, I automatically revert to one of my favorite books, â€œThe Invisible Man.â€ In the opening scene, our nameless protagonist gives a speech in front of the cityâ€™s leading White men accepting a scholarship and after the speech, he is pressured to fight with other Black boys in a ring blindfolded. After being pummeled, the White men put a couple coins and dollars on a rug and force the boys to fight over the money. Little to the boyâ€™s knowledge, there is an electric current running through the rug and in excruciating detail, the protagonist describes the pain of being electrocuted. For more on this topic, visit the site, Electrocuted While Black. I think CNN did a better job tonight.Â They showed the challenges both sides face. They showed the average black man and his struggle.Â Although I think they still did not focus on answers, and it was more of the same as yesterday, this was more powerful and effective.